It was an honor to be asked to contribute to the keepsake exchange celebrating the sesquicentennial of the birth of Frederic W. Goudy, organized by RITs Cary Graphic Arts Collection.Last summer, while visiting the Cary Collection (which you can read about here), I was introduced to the work of Albert Schiller and was immediately enthralled with the detailed and incredible use of metal type ornaments to create 'type pictures'. One of my favorites was a relatively simple one-color form done as tribute to Fred Goudy. Given that the keepsakes would be collected by the fine folks at the Cary Collection I felt I should attempt to recreate this piece for my offering. Here is the form when first assembled. Below is the first carbon proof of the form; not fancy but enough to know approximately how it would look in print. Behind is my photocopy of the Schiller piece. Not an exact copy, given that Schiller and I clearly had different sorts to work with, I wanted it to merely reference the original work. 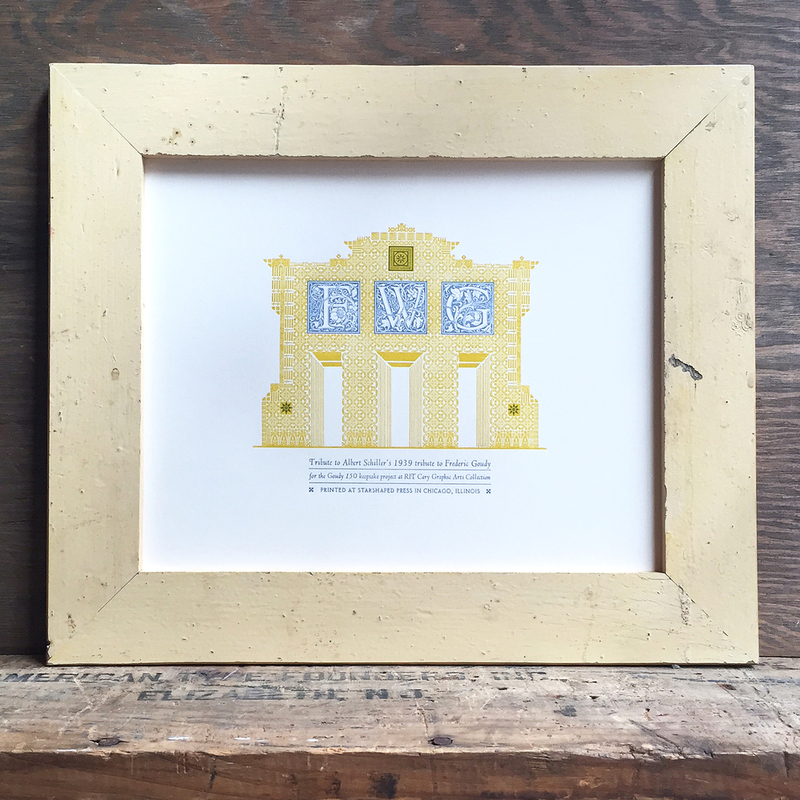 I first printed the full form, knowing that I'd eventually like to print it in two colors. The first color was a cheery mustard-yellow. I placed solid pieces behind where the side and top star-like ornaments would be overprinted. Here's the last print to come off the press with the second blue color. 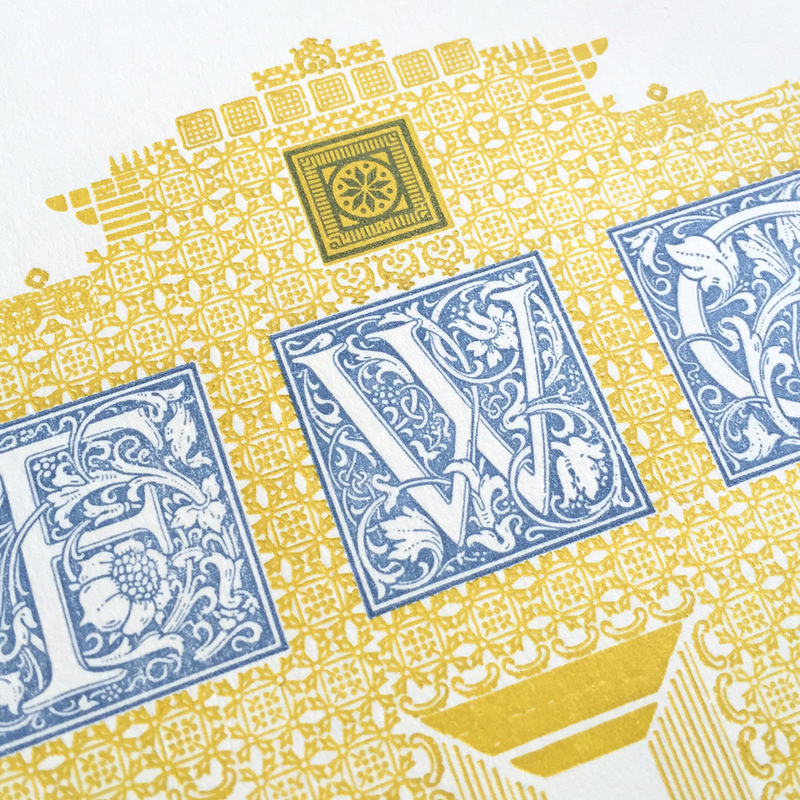 You can see how overprinting the blue on yellow altered the color of those particular ornaments. I left the lovely Cloister initials with no color behind them so they would pop. The type was set in Deepdene and Camelot, both Goudy-designed typefaces. 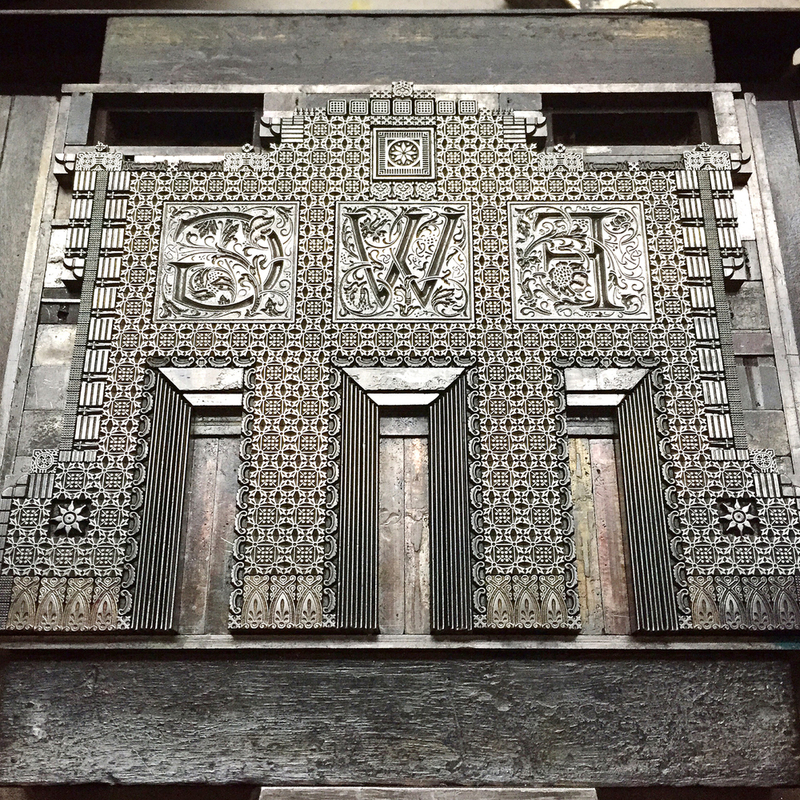 I joked when putting together this form that Schiller must not have liked Goudy much as it felt like one of the easiest he, and subsequently I, had done. Then I discovered that the devil was in the printing; it was one of the hardest pieces I have printed. This is mostly because of a few key elements: the ornaments are set very solid and must be perfected planed (flush to the base they rest on), the 'doorways' required mitered rules that are very small and difficult to master and the registration was impossibly tight. Now I know that Schiller loved Goudy and I still have a long way to go to come close to the brilliance of his work.